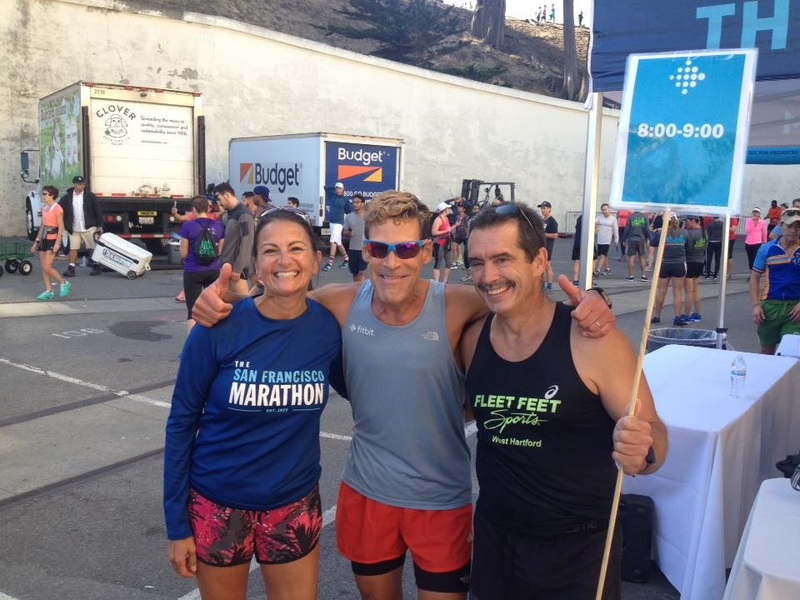 As the hours pass and even days since I’ve run the San Francisco marathon there had been many thoughts that I had during the race that I wanted to share before they are just faded memories. I’m sure we’ve all had very detailed thoughts during races that we wanted to share and then as more days pass, slowly the thoughts fade away, trying to recall them seems difficult. 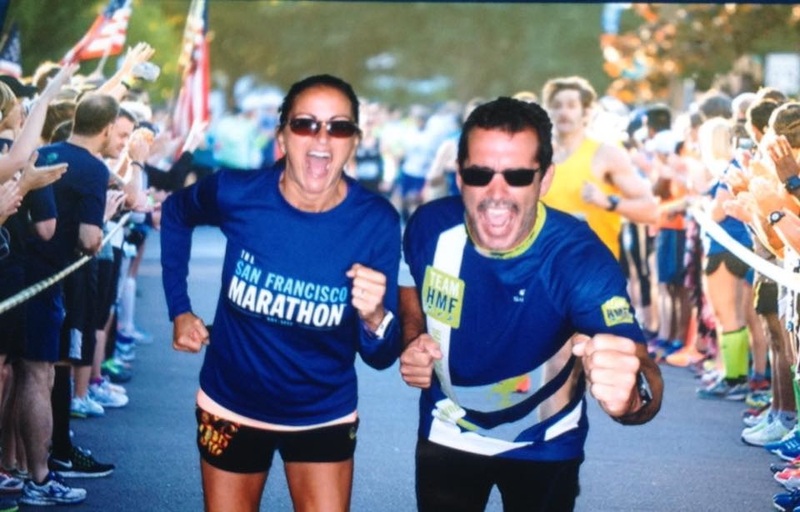 Before too many days pass I wanted to share some of those thoughts that I had during the San Francisco marathon. The race start was at 5:30 am. I woke up early, ate breakfast, took care of business and headed out the door. Everything was good! The morning was nice cool and it was still dark. I am familiar with the course so the first couple miles went by in a blink. I like to listen to all the noises as I run. The different sounds of the people’s feet hitting the pavement and all the different conversations going on. They range from pace, eating, strategy, positive affirmations and sometimes even bickering. I recall listening to a couple argue about waiting for their friends that were behind them. The man kept saying “What do you want to do? Should we wait for them?” and she kept saying over and over “I’m doing my own thing”. Then I heard it – the sound that we runners never want to hear – she must have lost her footing somehow and she went down with a splat - sounded like a big belly flop in the water. I heard her cry out with pain as she hit. You could hear the other runners gasp too. I just kept hoping she was able to get back up and continue. I kept going and paid a little extra attention to the streets, curbs, poles and any other obstacle we had coming. Chrissy Field climb. After a long straight away we approach the next climb. This is a pretty steep hill going up to The Golden Gate Bridge. It’s still pretty dark outside. Again, sticking to my strategy and instilling in my mind “Jeanne, you got this, this is easier than those Norfolk, CT hills. You are trained for this” I powered up to the top and looked ahead to get a glimpse of the Golden Gate Bridge. The fog was so thick you could cut it! The bridge was barely visible. Up Up and Up we climbed. This next stretch is like the scene from the movie “Beverly Hill cops”, except we are running up those San Francisco streets (not down). To me this is a good comparison to hill training. Power up and recover down the hills. I actually love this part of the race! Running through the city streets and the houses that are stacked on top of these hills is pretty incredible. Golden Gate Park – The next phase – running through the Golden Gate Park. There was a lot of overcast so I was unable to see a lot this year. The course now is a gradual climb up until you reach the highest point near the water and then it’s down and out. The park seems to be the longest part to me mentally. All I want is to get out of the park! 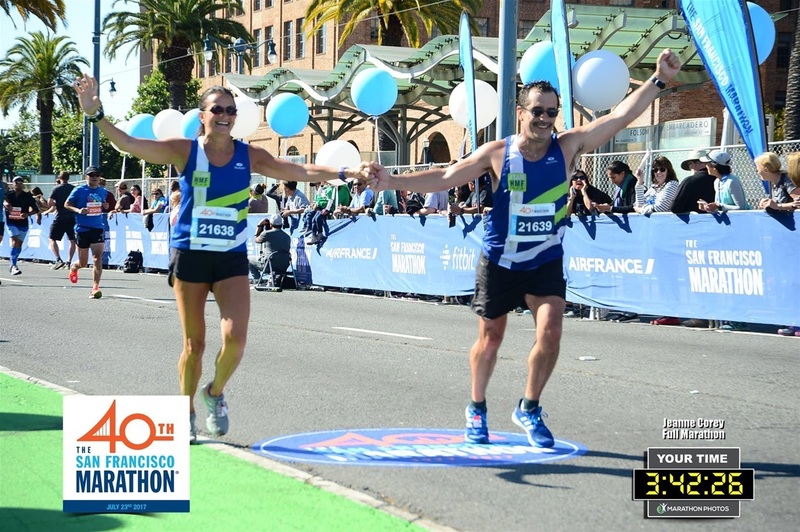 It’s tough because the ½ marathoners branch off and then branch back in. There is even a section that we get to see them cross the finish line. As they finish we run by and finally head out of the park! There is a small hill that pulls you out of the park that is short but is at the worst time. My quads were really starting to feel this now and the sun just came out. How many miles do I have left? LONG stretch – Mile 19-20 was somewhat like a mirage. The sun was shining and there is just this long straight away ahead. This is when I start to count steps to keep my mind off of the distance. “Just get to mile 20 and there is a nice downhill” I kept thinking. “Why? 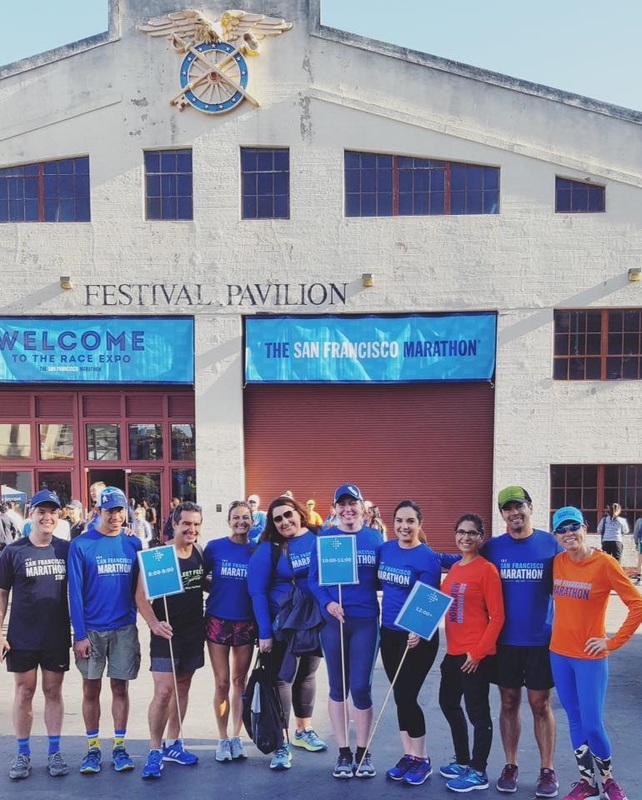 Why did I post so much on social media about this race? People are probably tracking me. I need salt, no I need GU, no I need electrolytes, and maybe I’ll walk at this water stop. I’m so hot my feet are on fire. My hands are swelling and my fingers are like sausages”. My watch chimes Hey, I can still have a decent mile and just walked. Guess what, I’m walking at all the water stops! AT&T Stadium – “I don’t care if I PR – I just want to finish”. I was so hot at this point. Then I see if ahead! WHAT? They want me to jump up onto a curb to get into the park? I see all the people in front of me jumping up onto the curb. I can do this……yep – I did it. I am on the curb. OUCH - My quads feel like I’m being stabbed! We run around the AT&T ball field and these were these really cool plaques in the pavement. Not sure what they said, but I remember wanting to stop and read them. Then here is comes again – the volunteers are yelling “step down” What? I have so step off the curb now? “Where is the finish”!? The Home stretch – There is ½ mile to go and there is one more water stop. I’m not stopping. I have to keep going – don’t give up, people are tracking you, count steps, no don’t count steps – how about sing the “Ant song” that usually helps....So I start singing in my head “the ants go marching one by one hurrah hurrah, the ants go marching”…..wait was that one or two ants???? Then I can hear the announcer and the cheering at the finish line. I can just about see the blue color of the finish shut! The finish is close! 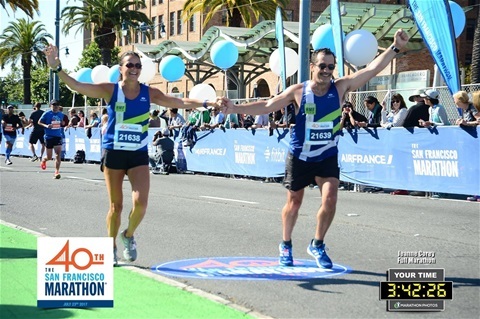 I’m running and Kim grabs my hand – I am so happy – I doing it! I’m finishing! OMG – it’s over! I just crossed the finish line and I am filled with joy and excitement. My eyes are tearing up! My phone is buzzing with text messages. I can’t wait to call my friends but I still can’t catch my breath! After walking and grabbing water everything settles down. 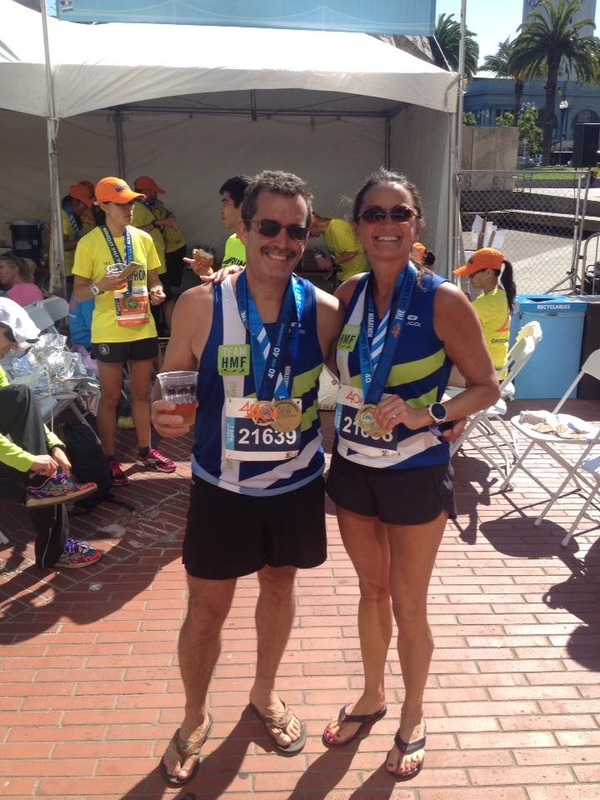 I ran the San Francisco marathon, again! I had a pretty decent time! The last few miles of pain are already gone! Next year’s marathon can’t come soon enough. I have run over the Golden Gate Bridge and finished strong! I am pretty proud and thankful for everything that I have in my life. Running has brought so much “positive” opportunities to me. To think it’s all from lacing up those shoes back in 2008 and thinking “maybe I’ll try running” that got me to where I am today, 44 marathons later.